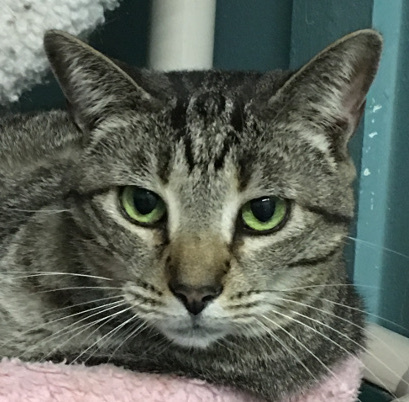 My name is Pocus, and I am a special cat who seeks a special home. I have been at the HSCC for several years; when I first arrived, I was so scared of everything, and I wouldn’t let anyone handle or even touch me! Since then, some kind people have helped me learn that no one is going to hurt me, and that it can feel nice to be petted and stroked and talked to. I enjoy those things now, but it has to be on my terms: I am not comfortable with my head being touched, but I am willing to learn. I need to feel safe and know that my space will be respected. I am in good health, and I enjoy the company of other relaxed cats, but no dogs or children, please. I would do best in a calm, quiet home with someone who is patient and willing to give me the time to blossom. I promise I’m worth it.